Imagine that a health system enrolls all of its fully at-risk patients into its high-touch care management program to better manage costs and care quality. The care management team must understand the medications each patient is taking, whether or not they are adhering to them and if they are following their care plan. To do this successfully, access to timely and accurate medication history data is essential. Without it, care managers have to rely on outdated data or contact pharmacies directly. Or they have to spend their time on the phone with patients, family members or caregivers who sometimes provide inaccurate or incomplete information. This takes care managers’ time away from more important tasks. But care quality will suffer without understanding the patient’s medication list and adherence patterns. This lack of comprehensive patient information represents a “data gap,” which prevents care coordination and causes care duplications costing an estimated $148 billion — $226 billion annually. Data gaps can lead to incorrect diagnoses or treatments, resulting in serious harm to patients or even death. Approximately 75 percent of all medical events include a medication treatment, and chronically ill patients account for 91 percent of all prescriptions in the U.S. This creates an incredible volume of data. Yet for healthcare providers, getting this data is a challenge. In fact, 88 percent of healthcare organizations report difficulty in gathering data from outside of their network. Where is this massive amount of medication data? And what prevents healthcare providers from getting it? The answer is simple. There are walls around it. It lives in separate locations and systems that often cannot easily and securely exchange information across geographical or technological boundaries. 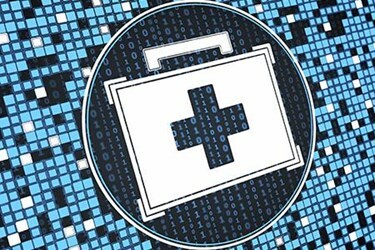 One of the major challenges electronic health records (EHR) vendors are tackling is their ability to access and provide this comprehensive patient information to providers, including information from care locations outside of a particular region or health system. Many EHRs are isolated from the data in other EHRs or health systems, making it nearly impossible to share. For example, if a patient is seen at a hospital, the information from that visit is often inaccessible by other healthcare providers or health systems using different technology platforms. However, when providers and hospitals connect to Surescripts, they can access timely and comprehensive medication history data, regardless of EHR or health system. This capability is a core element of true interoperability, and key to effective population health management. Healthcare providers use a variety of sources to get their patients’ medication data and manage their at- risk populations, including internal data from their hospital or health system, connecting to third-party vendors, or obtaining health plan claims data. The problem is that these sources tend to be outdated, incomplete or both. While claims data is certainly a cost-effective component to completing the picture, updates can lag by weeks or even months. It is also limited because it is payer-specific, lacks detail beyond what is required for billing purposes, and does not capture information from cash-pay prescriptions that occur outside of the claims process. This poses a major problem for healthcare providers and puts their patients at risk. But it also presents an opportunity for a shift in our thinking about access to medication data to manage population health. Giving hospitals and health systems a single connection to multiple data sources via a nationwide health information network like Surescripts lets them see the most current and complete medication data available, sourced directly from pharmacies and pharmacy benefits managers (PBMs) which are updated within days, not weeks or months. In particular, the pharmacy fill data sourced by Surescripts is a valuable source of information to effectively manage the health of patient populations. It is refreshed nightly and is more comprehensive than claims data with more specific prescription details. This means it can be used to flag potential medication abuse, pinpoint gaps in care, identify and triage at-risk populations and help care managers determine whether or not patients are filling and taking their prescriptions regularly. Medication adherence can be improved by electronic solutions that use insights and alerts to quickly let busy care managers know if there may be an adherence issue. For example, if a patient hasn’t yet filled a medication, their healthcare provider can have a proactive conversation with them to prevent issues before they arise. By delivering relevant and timely actionable intelligence, Surescripts helps make effective population health management possible. It knocks down the “walls” around a given health system or EHR. It provides the most updated and comprehensive medication history information available — from both pharmacy fill and claims data — via a single connection, giving care managers the information they need to conduct proper analytics. This is the foundation for understanding the risks patient populations are facing and to improving care quality, increasing patient safety and lowering costs. Surescripts only provides pharmacy medication data to healthcare professionals and only for the purpose of treating a patient. There are processes and procedures in place to ensure data is being accessed and shared appropriately. Surescripts also has a rigorous system in place to protect the data. In fact, Surescripts is one of only 105 companies in the U.S. that is ISO 27001 certified.